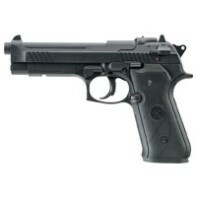 The AG92 gives the look and feel of the popular Beretta® 92 in an easy shooting CO2 powered airgun. Powered by two CO2 canisters, the AG92 fires .177cal pellets at 280FPS. The dual cylinders provide twice the shooting time. Pellets are fired from 7 round cylinders that can be quickly and easily loaded into the air pistol.